love, laurie: a sunday morning breakfast date! a sunday morning breakfast date! on sunday morning, we had a little bit of free time early in the morning before we had to go to the theatre for the matinee performance of nunsense. since we haven't done anything fun in a long time because of our work schedules, we decided to wake up early and go out for breakfast. we went to our new favorite spot which we tried for the first time on the morning of my birthday. the food is so good! 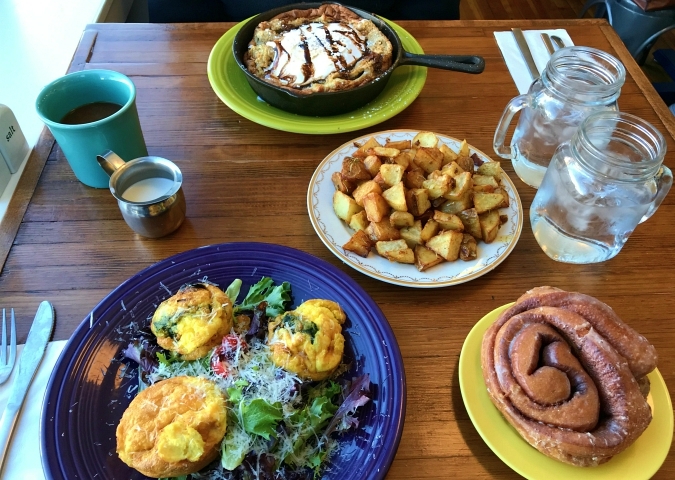 we shared muffin-tin frittatas, rosemary-dijon potatoes, a campfire-themed dutch baby pancake, and a cinnamon roll doughnut. everything was so good. we knew we would have extra, so we were happy to be able to take our leftovers with us in a doggie bag and have them as a snack after the show! it was a nice little sunday morning breakfast date! Can't wait to try that new place. Food looks different and delicious.